and have collectively donated more than 20,000 hours of volunteer service to the Foundation over the past nine months. This entry was posted in C Diff Foundation and tagged C diff education, C Diff Foundation Members, C Diff Foundation Volunteer Patient Advocate Program, C diff Support, Clostridium difficile information, Clostridium difficile information and support, How can I learn more about C-diff, how is a C diff infection treated, Volunteering Makes the Difference with the C Diff Foundation, Who is at risk for a C.diff. infection? on April 29, 2018 by cdifffoundation. The C.diff Foundation is working with a partner to conduct a survey about your experience with a C.diff. infection to help inform educational initiatives for C.diff patients and caretakers. If you or someone you know has had a personal experience with a C.diff, infection please go to our website, www.cdifffoundation.org, and take the short survey. Thank you for making a difference and shaping the future of C. diff. infection prevention education. This entry was posted in C Diff Foundation, Continued education and tagged C diff education, C. diff. advocacy, C. diff. survey, C. difficile survey, Clostridium difficile survey on September 28, 2017 by cdifffoundation. while Raising C. diff. awareness. There will be C. difficile Infection prevention, treatments, environmental safety information provided by clinicians and healthcare professionals and much more during this fun filled evening in New Port Richey, Florida. Enjoy a four course white glove plated dinner with entree choices of beef or chicken, with outstanding entertainment. This entry was posted in C Diff Foundation, Raising C Diff Awareness Education and tagged C diff education, C Diff Foundation Global Network, C. diff. community, Cdiff education, Flagstaff Arizona, New Port Richey, Raising C. diff. Awareness C Diff Foundation, Spartan Manor, Spartan Manor New Port Richey FL, Tampa Bay Community Cdiff event, Tampa Florida, Xenex on August 24, 2016 by cdifffoundation. President Richard Nixon established National Volunteer Week with an executive order in 1974, as a way to recognize and celebrate the efforts of volunteers. Every sitting U.S. president since Nixon has issued a proclamation during National Volunteer Week (as have many U.S. mayors and governors). Since then, the original emphasis on celebration has widened; the week has become a nationwide effort to urge people to get out and volunteer in their communities. To each C Diff Foundation Volunteer Patient Advocate, , on behalf of all the staff and the thousands of members around the globe we want to say THANK YOU! Your continued support and efforts contribute in a significant way to our mission of educating, and advocating for C. diff. infection prevention, treatments, and environmental safety awareness worldwide. We celebrate our volunteers and this week stands as a reminder that our daily work sharing information, educating, and advocating for C. diff. infections, remains not only critical but it is urgent. We do not know when new interventions to prevent, to treat, and protect our environments with products that will eradicate C. diff. spores will become available to the public. The good news is that we do know that there are many positive interventions presently in clinical trials, which give us all HOPE. This is why acts of sharing the C Diff Foundation literature during every opportunity quickly opens doors of knowledge helping others learn how to prevent acquiring this painful and life-threatening infection, treatments available, and disinfecting products with EPA Registered C. diff. kill for environmental safety– to help save lives. The C Diff Foundation Volunteer Patient Advocates build awareness, help build support and provide education of C. difficile infection prevention, treatments, and environmental safety measures to patients, survivors their families and community healthcare professional centers/offices. They also guide individuals in giving a voice to patients, survivors and their families on healthcare-related infections, informing the public, health-care providers (hospitals, healthcare professionals, etc. ), organizations of health-care professionals, the educational world, with the medical, Governmental agencies, and pharmaceutical research communities. We provide our Volunteer Patient Advocates with the necessary tools, and updates to generate positive results. 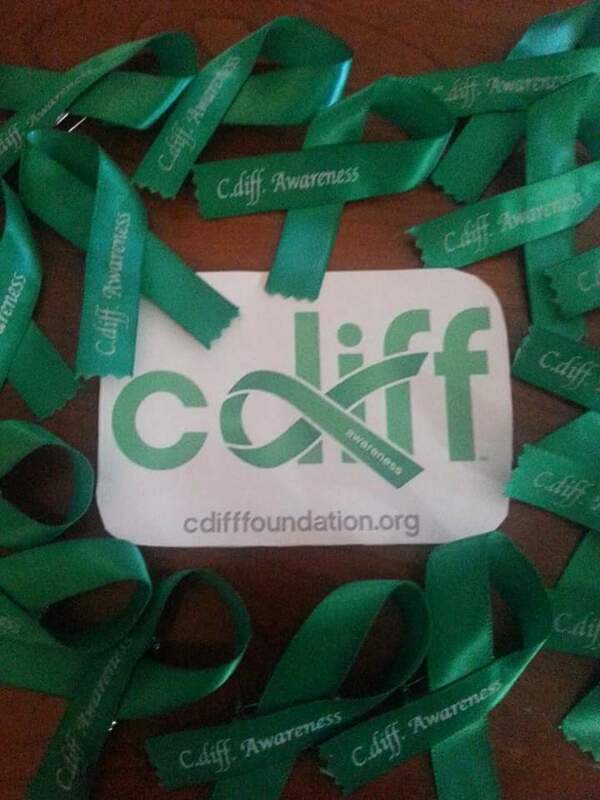 By becoming a C Diff Foundation Volunteer Patient Advocate you will make a BIG difference and help spare others the pain, suffering, and tragedy of loosing a loved one that is caused by a C. diff. infection. Your continued donations received during the year are always appreciated. Your gifts assist the Foundation in promoting C. diff. infection prevention, treatments, and environmental safety education, and advocacy to healthcare professionals, families, patients, and communities world-wide. We are grateful for your assistance, dedication, and support and we hope the Foundation has also been helpful to you. If you have any suggestions about how we can serve others better or share the information more effectively, please let us know. You are welcome to email, telephone, or write to the Foundation at any time. We certainly look forward to your continued Volunteer Membership in the Foundation. There is so much more that needs to be accomplished and we continue to move forward together promoting our mission, which is entirely dedicated for the good of others. May you and your families experience continued HOPE for good health, happiness, and peace throughout the year. C Diff Foundation’s mission today. This entry was posted in Volunteer Patient Advocate Program and tagged C diff education, C Diff Foundation Volunteer Patient Advocate Program, C Diff Foundation Volunteer Program, C diff Global Community Support, C difficile Advocacy, C difficile support, C. diff. for healthcare, C. diff. prevention, Clostridium difficile education, Volunteer Week 2016 on April 13, 2016 by cdifffoundation. In addition, an estimated 15,000 deaths are directly attributable to C. difficile infections, making them a substantial cause of infectious disease death in the United States. [i]. We now speak for the thousands of patients within the United States who, each year, are diagnosed with a C. diff. infection. This growth, in part, reflects the value C. diff. support groups will provide, not only to patients, their spouses, and families who are living with and recovering from a C. diff. infection, but also to the countless number of individuals who will become more aware of a C. diff. infection, the importance of early detection, appropriate treatments, and environmental safety protocols. There will also be Bereavement support group sessions for C. diff. survivors mourning the loss of loved ones following their death from C. diff. infection involvement. The CDNCS program sessions will be hosted via: Teleconferencing with leaders hosting from Maryland, Florida, Missouri, Colorado, Ohio, and Oregon. The Colorado CDNCS group is offered at a public venue and will be hosted in Arvada, Colo. every third Tuesday of each month, beginning November 17th. The Meeting will start at 5:30 p.m. and end at 7 p.m lead by a C Diff Foundation Volunteer Advocate and C. diff. survivor Mr. Roy Poole. To participate in any CDNCS group being offered during each month, all interested participants will be asked to register through the Nationwide Hot-Line (1-844-FOR-CDIF) or through the website https://cdifffoundation.org/ where registered individuals will receive a reply e-mail containing support group access information. This entry was posted in C Diff Foundation, C diff Global Community Support Program, Support and tagged C Diff Awareness, C diff education, C diff foundation, C diff Nationwide Community Support, C diff Support, C difficile information and support, CDC, Clostridium difficile information and support, Depression, Financial Support, Grief Counseling, Healthcare, Healthcare Insurance, Healthcare providers, Healthcare-Associated Infections, Homecare, Hospital support, Infection Nationwide Support, infection prevention, Nutrition, Patient safety, Surviving a C diff infection on October 29, 2015 by cdifffoundation.